I hope everyone had a great Thanksgiving, a holiday that I personally consider our best national holiday (among a lot of great choices, for sure). Reminding ourselves what we’re thankful for is a very humbling and important thing to do, and I must say that I am very thankful for all of you, our outstanding Y volunteers and associates, who number over 10,000 strong and work tirelessly for a better, stronger community — for a better us. You are a force to be reckoned with! 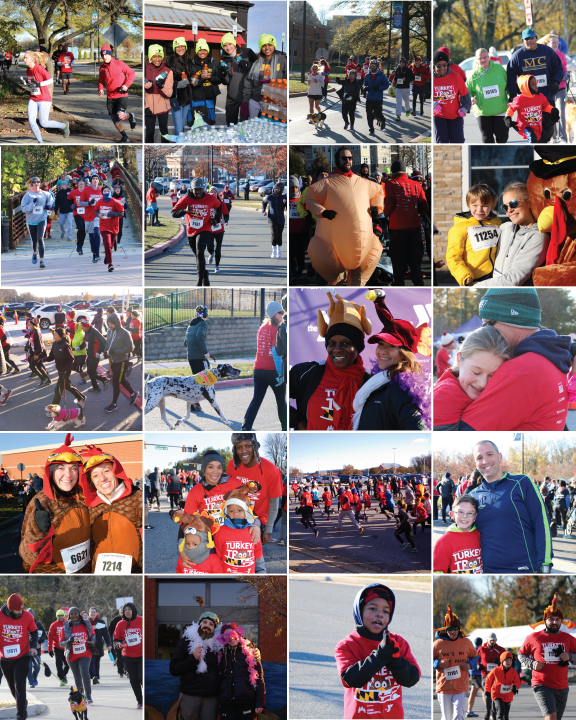 In case you didn’t notice, we had this little event on Thanksgiving morning that drew more than 15,000 runners, walkers, volunteers, sponsors and donors across seven locations on Thanksgiving morning for our annual Turkey Trot Charity 5k. I know that a large percentage of the people reading this were there in person (or, if you had to travel for the holiday, there in spirit). With thanks to our colleague, Debra Einstein, I thought I’d share with you some history around the origins of this unique event, which unsurprisingly derives from the Y.
History’s first documented turkey trot can be traced to Buffalo New York, on Thanksgiving Day of 1896, the same year the modern Olympics debuted. Put on by the local Y.M.C.A., the race featured 6 competitors — only 4 of whom actually finished (as Runner’s World notes, one competitor dropped out at the 2-mile mark, and another ate a “late breakfast refused to keep in its proper place”). The winner, Henry A. Allison, triumphed in a time of 31 minutes, 12 seconds (about 6:16 per mile). The event slowly gained popularity and other small turkey trots popped up across the country. For many years, running was considered a fringe sport for weirdos and masochists, and was thought to be detrimental to one’s physical and mental health. That is, until 1961, when a Kiwi by the name of Arthur Lydiard launched the world’s first jogging club in New Zealand and extolled the sport’s cardiovascular virtues. On a trip abroad in 1966, Bill Bowerman — a future co-founder of Nike — witnessed Lydiard’s movement, and was impressed. He returned to the United States and published “Jogging,” a tome that sold 1m copies and launched a running frenzy. In the wake of the international success of prominent American runners like Steve Prefontaine and Frank Shorter, turkey trots quadrupled in number during the 1970s. In the early days of turkey trots, women were not welcome. Most physiologists were still trotting out the tired narrative that women were “too fragile” for running. The International Olympic Committee barred them from competing in any event 5k-meters (3.1 miles) or longer. By the mid-1980s, the rules finally began to change — and Olympic distance runners like Joan Benoit Samuelson and Mary Decker inspired a broader sector of women across America to enter local races. As races neared gender parity, they naturally became more social events. Turkey trots were no longer just for solitary, mustachioed men: They were a family affair. Today, Thanksgiving Day is the most popular running day in America: Across the country, more than 1m people run in 1k+ events — more than Christmas, St. Patrick’s Day, or the 4th of July. So, here in 2018, on a chilly late November morning, we once again successfully upheld a great community, family and Y tradition and, in the process, raised over $800,000 to support the Y’s mission and those who need us most in our community. Kind of makes you proud to be a part of, huh?